The stator is the stationary component of electromagnetic circuits. In different configurations, stators may act as field magnets that interact with the rotor to create motion, or as armatures that work with moving field coils on the rotor. They are generally permanent magnets or electromagnets that maintain field alignment, with the latter being a field coil or winding. 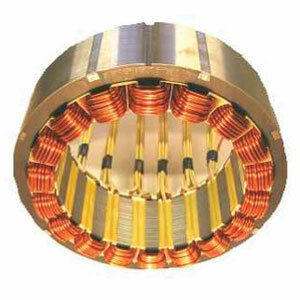 The stator in AC motors consists of the core’s thin, steel laminations and the coils of insulated wire inserted into it, which are called field windings and are connected directly to the power source. When current is applied, the two together become an electromagnet. In DC motors, the stator carries both the field windings and the poles, which constitute the magnetic circuit with the rotor. Field windings in that case may be either windings or permanent magnets on the stator; the poles house the field winding, with the number determined by voltage and current.